Composite cladding is fitted onto the exterior of your home, providing it with an extra layer of protection. But that’s not all, this lightweight, easy-to-fit alternative to traditional timber cladding will transform the look of your home for the better too. Manufactured by Eurocell for proof of product quality, when installed by the expert Roofline Solutions team, Coastline composite cladding will last for years to come. Beautiful woodgrain finish ensuring an authentic timber aesthetic that will significantly enhance a property’s visual appeal. Manufacturers 10 year guarantee against warping, cracking and discolouration. Utilises a simple interlocking mechanism that allows for speedy installations, minimising the disruption to your everyday life. Manufactured from sustainably sourced materials that are 100% recyclable. Can be maintained with the odd clean. No need to worry about repainting or treating, even after years of service. Minimal expansion and contraction, resulting in long-lasting protection for your home. Highly durable material that protects your home from the weather and UV rays. 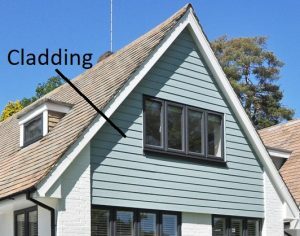 Our composite cladding is available in 6 unique New England colours, so there’s an option available to suit all types of property, from new build homes to older brick exteriors and anything in between. Select from Anthracite Grey, Moondust Grey, Pigeon Blue, Oyster, Soft Green and Taupe.